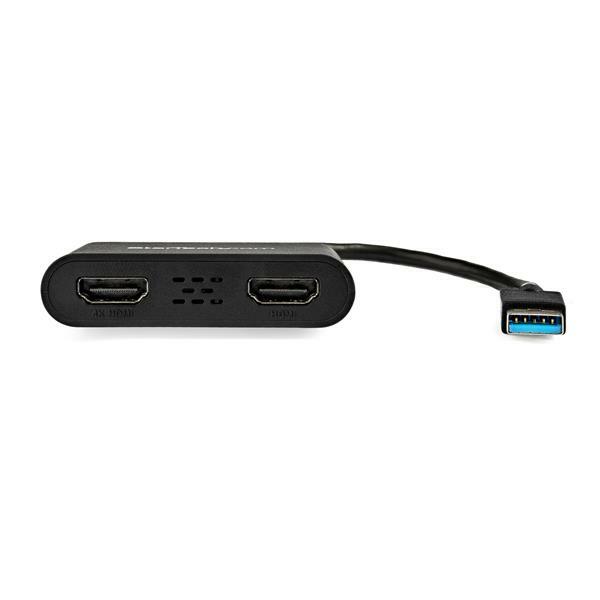 This USB to HDMI® Dual Monitor adapter lets you add two independent HDMI displays to your computer using a single USB 3.0 port. One of the HDMI ports can output resolutions up to 4K, while the other can output resolutions up to 1920 x 1200. Adding more displays to your workstation can be difficult, especially if your computer does not support MST or offer many external video ports. This USB to dual HDMI adapter features two video outputs, boosting your productivity by giving you more screen space to work from. With multiple displays you have the freedom to access multiple applications at the same time and reference material on one display while you compose on the other. One of the ports on this USB video adapter supports resolutions up to 4K at 30Hz, meaning you can connect a 4K monitor, HDTV, or projector to your computer, even if your laptop or desktop video card doesn’t natively support 4K output. The USB to HDMI 4K adapter lets you extend or mirror your primary display onto an Ultra HD monitor or television, giving you the additional screen space you need to simplify multitasking and maximize your productivity. Using the high-bandwidth USB 3.0 interface, this USB 3.0 to HDMI adapter enables smoother scrolling through documents, higher resolutions and better overall performance than earlier USB adapters. This video adapter is intended to support all of your business applications including web browsing, e-mail, spreadsheets and presentations. You can also leave your system video card available for more demanding applications such as gaming or CAD design, while you use the USB monitors for reference material. The USB32HD2 is backed by a StarTech.com 2-year warranty and free lifetime technical support. What is a USB video adapter, and how can I tell if it will work in my setup? You may have heard of USB video adapters, and have been wondering what they are, and whether or not they will work in your setup. USB video adapters are devices that take one USB port and go to one or many video connections, such as VGA, DVI, HDMI or DisplayPort. This is useful if you would like to add an additional display to your computer setup, but are out of video connections on your computer. USB video adapters allow you to mirror or duplicate your display, so the same windows are shown on all of your displays, or extend your desktop, so that you can have different windows on each display. So what do you need to know before you purchase a USB video adapter? USB video adapters require the computer to have a free USB port. Check which video connections your display has, and select the appropriate USB video adapter. Ensure that the USB video adapter is compatible with your operating system. USB video adapters require your video card to be able to handle an additional display. This is because USB video adapters work with your onboard or dedicated video card to drive additional displays. For this reason you are advised to confirm this with your video card manufacturer. Consider what you will be doing on the additional display. If you are looking to perform less graphically intensive activities like using Microsoft Office, email, or basic web surfing, you can use any USB video adapter. If you are looking to perform more graphically intensive activities like high end photo or video editing, you want a USB video adapter with dedicated memory. When using multiple USB video adapters on the same computer, they need to use the same chipset family. For example, MCT/Trigger, DisplayLink or Fresco. Note: How many adapters you can use depends on the SKU. You may not be able to use a USB video adapter with an All-In-One computer. These computers are almost always hardwired to only accept a single display. You may not be able to use a USB video adapter with a touchscreen computer or display. A mixture of touchscreen and non-touchscreen devices can conflict with the video card. You should not use a USB video adapter to play video games. They are not designed for use with video games, and their performance with them is poor at best. Note: Do not physically connect the USB video adapter to your computer until you are instructed to (Step 5). Prior to installing this device, please ensure that your operating system is up to date (for example, you have installed the most recent service pack). Note: Windows will typically save the files to the Downloads folder that is associated with your user account (for example, C:\Users\your_name\Downloads). Once the download is complete, right-click the zip folder that you downloaded, select Extract All, and follow the on-screen instructions. In the list of extracted files, right-click the Setup.exe file and select Run as Administrator. Note: If the Run as Administrator option is not available, you might be attempting to run the installer from within the zipped file. Extract the files using the instructions in Step 2. Follow the on-screen prompts to install the device drivers and restart the computer when prompted. Once Windows has restarted, connect the USB video adapter to your computer. Your computer will automatically complete the driver installation and your device should be ready to use. Note: Installation may take several seconds to complete. During the installation your display might flicker; this is normal. Once the installation has completed you will see your Windows desktop extended to the additional monitor. Prior to installing this device, ensure that your operating system is up to date (for example, you have installed the most recent service pack). Note: Windows will typically save the files to the Downloads folder that is associated with your user account (for example, C:\Documents and Settings\your_name\My Documents\Downloads). In the list of extracted files, double-click the Setup.exe file. 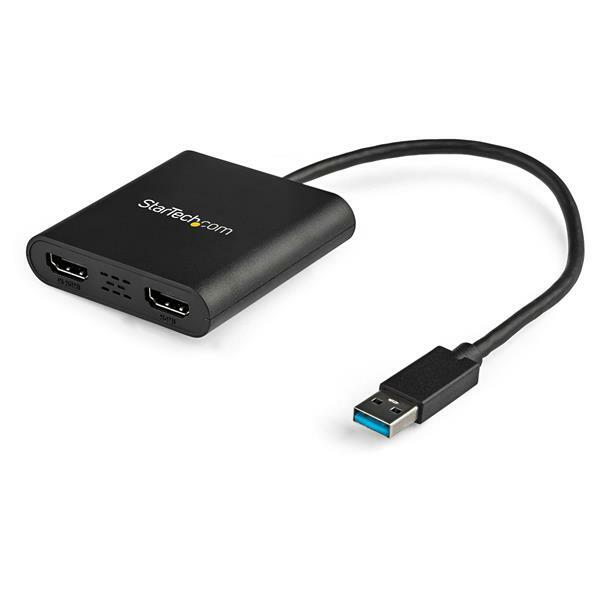 How do I uninstall the StarTech.com USB video adapter from my computer? Note: Physically disconnect your USB Video Adapter from the computer before completing the steps below. On your keyboard, press the Windows Key + X.
Click Uninstall a program to display a list of all installed software on your computer. Locate and select the USB Display Device (Trigger Family) software. Click Uninstall at the top of your screen to begin the removal process and restart your computer when prompted. Click Add/Remove Programs to display a list of all installed software on your computer. Click Remove to begin the removal process and restart your computer when prompted. Will my touchscreen / all-in-one computer work with a USB Video Adapter? A mixture of touchscreen and non-touchscreen displays can cause a conflict with your internal video card. Because of this limitation, touchscreen functions may be disabled when the USB Video Adapter is connected, or the USB Video Adapter may not work at all. Contact the manufacturer of your system to confirm whether your specific model can support a secondary display or not. Many all-in-one computer systems limit the number of possible monitors to one. This is a limitation in how all-in-one computers are typically manufactured, so adding an external display may not be possible regardless of which USB video adapter is used. Contact the manufacturer of your system to confirm whether your specific model can support a secondary display or not.